The Howland Haggerty Pell estate, originally part of the Willets family homestead, enlarged c. 1910 in Old Westbury. Pell was a founding member and partner of the firms S.H.P. Pell & Co. and Pell & White. 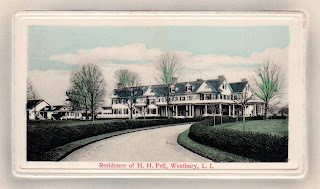 He was also a retired lieutenant commander of the New York Naval Militia and served as the paymaster of the USS Indiana during World War I. Pell was married to Mary Willets from 1895-1919 and the property was originally in the name of her mother. Most of the residence was demolished sometime between 1950 and 1966 but click HERE to see where the house stood on google earth and HERE on bing. Link at wikimapia to a Life article on the North Shore. In it a statement that draws my interest - "was one of the North's Shore's leading debs". Anyone have any further insight? If we're putting it to a vote, I'd guess 'replaced', not 'altered'. There's not a chimney, not a wing, not a window that lines up---or the wrong house? No insight. Wendy Iglehart used to get mention in the columns, back in the days that debs still used to get space. Her trajectory was pretty much the usual---popular deb, much photographed where debs used to be photographed--Saratoga, Newport, Palm Beach, served on junior committees, got a typical post-deb job at Harper's Bazaar, left job to marry Tex McCrary, (the man to blame for talk shows), divorced Tex McCrary, (who then married B actress Jinx Falkenberg), Iglehart married someone else, died in 1968. This minute biography brought to you by Downeast Dilettante and Google. DED...I had the same thought. Though when you look on historic aerials the house that is there today was there in 1966...though it definitely appears altered since then. Unfortunately the aerial is too fuzzy to get any sort of worthwhile detail from it however. C.C. Pell Sr. died at 79 in 1964 and was living in the house at the time. His son C.C. Jr. died in 1998 and his obituary said he had made Rhode Island his home since the mid 1970s. MyNas has a build date of 1908, remodel date of 1993, describing it as a Colonial. Comparing the current photo reached via wikimapia and today's post - I can see some hints that its the same house. I can spot some 1993-type renovations---like those misguided arched replacement windows in the dormers, but the overall design certainly appears earlier. Well, this is interesting: In the 1966 historic aerial, the newer house shows pretty clearly as part of the La Granja property---its drive came off the Iglehart drive, and the landscaping of the two seems to integrate---I could certainly see the 'Pell' house as by D&A for one of the Iglehart children? Whats the date of this postcard? Zach has pointed to the SPLIA book page 516 showing the garden side of this house. MapWorks 1927 has the Pell property abutting "La Ganja" to the west and "Turnpike Cottage" to the north. It also shows that the house labeled in Wikimapia as Pell was actually on the La Granja estate, and that La Granja included the land immediately below the race track at Arlough. It further shows the Carle Place as having become part of the actual Pell place. There, that's all straightened out? The Pell property lines up with the Cross and Park estates to the north so I don't see how La Granja creeps over the line and Carle/Mary Buel property to the east lines up with the Webb estate. if you look to the north of said Pell tag - using the 1966 aerial there is a arch of trees the could be remnants of the curved drive in the postcard and to the left of that perhaps remnants of a garden as pictured in the SPLIA book? No, look again. In side to side comparison, The current boundaries on Wikimapia don't follow the boundaries on the 1927 or 1939 maps, or the 66 aerial. The house labeled as Pell on Wikimapia reflects the former top boundary of La Granja, which as mentioned, ran across and under the present Arlough race track. The 'Pell' house in 1966 was entered by a drive that was part of La Granja's drive. La Granja is now neither as wide nor as deep as originally--a new drive to the 'Pell' house takes a bit off, and of course, the Pell house and the field absorbed by Arlough take more. As to the Carle place, the little bump in the property line of the actual Pell property corresponds to the location of the Carle place, and an existing old tree (property line) in Wikimapia, clearly showing the Carle place to have been a part of the Pell property at that time. I did this on side by side comparison of the three maps, but overlay will show the same thing. Part of it still exists..it looks like its now on pinewood drive. Wow, certainly looks like it---leaving a new question--what is it doing on the Buell property rather than the Pell property? Was this wing moved there---or was the house actually at this corner? Or had the Pells sold this part of the property by 1927, when it shows as being owned by Roonie? The property card has the outline of original footprint with tidbits about the house being "very old, added to several times and parts are very cheap." I see some similarities in the house linked to Bing but it doesn't fit the map or the Pell family occupancy timeline. In 1966 that street was extant with at least half the houses built and absolutely no evidence of a large formal garden. Check out the picture in the SPLIA book...it had extensive landscaping. I suppose it could have been completely obliterated in only a year but it seems unlikely. from the southeast, one can match up almost every detail of the Pell house to this one---the only difference being some porches removed, and the right hand east gable window enlarged. Damn the assessors for not having a view from that angle on the property card! Do we suspect that perhaps CC lived next door at Carle House, and that when Herbert died in 26, this place got sold---it would fit the timeline suggested by the maps. Eve Pell (grandaughter and daughter respectively) penned a memoir called "We used to own the Bronx"
Howland Haggerty Pell had only one son, H.H. Pell Jr.
Clarence C. Pell and his son C.C. Jr. were likely cousins of some degree but not directly related to H.H. Pell. Clarence C. Pell resided in The Carle Place, a Quaker farmhouse that belonged to Silas Carle (namesake of Carle Place). H.H. Pell's estate was indeed at the corner of O.W. Road and Jericho Turnpike and has since been mostly demolished. HPHS---news of Zumba 21 has reached the midwest? The Eve Pell book is quite good---a clear eyed look. Howland Haggerty Pell was the brother of my great-grandfather, Stephen HP Pell, who commenced the restoration of Fort Ticonderoga in 1908. They were in business together, several different real estate firms being founded by the brothers to develop North Shore parcels of land. Clarence Pell was a distant cousin. My name is: Stewart B Iglehart and i grew up on La Granja property. i do see some of the old buildings,but they are hard to make out.